Yup... it is totally dead, no feeling, no pains, zippa' .... oh!!! you might be wondering, I'm talking about my special tooth. Another update from that excruciating pain before that I felt before. I went to see my dentist a week ago for a schedule of root canal. But since I got coward, I called the clinic and gives the 'white lies' like I can't make it for the first session as I too busy at work that I can't leave some works... hehehehe... Am I that bad? I hope not, I can't tell them that I'm scared to death, as I'm sure that I will feel such excruciating pain while they were going to take off my jacket. As the swelled gums was still getting worst and it's already reaching the front gums. 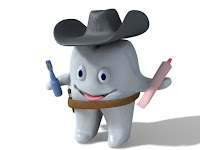 I need to get remedy for that pain tooth so that I won't be having predicament when I’m in US, as I’m taking all the advice of mostly who have been encountered going to a dentist and paying too much for the teeth repair, whereas I can only get it more cheaper here with the same quality. After hours spent with the dentist? Finally it’s done and my tooth is dead. No more feelings at all and I can even played it now with my tongue, out of curiosity I look at it in the mirror and seen that pain tooth dead. sori di me makapag-iwan lagi ng message sau lagi error page lumalabas pag click ko sa comments mo ehhh. Doon sa ako message board iwan ko sulat ni minsan. ako sis nagpabunot mao pa gyud pagkahuman di panga ko nagsasalita masyado kay daghan dugo. congrats for being courageous for your root canal session! hahaha. o diba, ati least hindi na sasakit ngipin mo. Hi Nova, would you like to exchange links in my blogs? If you are interested, please let me know so that I will add you soon. Thank you and have a great day. hi, sis la lang type ko lang magbasa ng tanan front post nimo. hate ko rin ang dentists sis...naku~ nakakatakot! whoaaaaa hehehe taslakan diay au kag ibot ngipon? saon.. mas hadlok pa ang dagom sa kano oi kay daku ug higanti sakit! lol jowk. ako gani naka schedule ko ibton upat ka wisdom teeth karong katapusan mura man kog ka back outon kay saon dunganon ibot tanan. Big Congrats,my friend!!! hay kadaku dyud kaayo na nga relief uy!!!! !intawon maayo dyud kaayo kay wala na ang sakit. karon puede ka na moapil sa contest ug paakanay!!! !hehehehehehe.